UCL will create a sophisticated multi-scale numerical simulation of the lighthouses that can be used with the data gathered on site to create long-term diagnoses. The numerical structural model will also be linked with advanced physical modelling at Plymouth University’s COAST Laboratory, and numerical (computational fluid dynamic) simulations. University College London (UCL) is a public research university, founded in 1826 in London, England. It is the largest postgraduate institution in the UK by enrollment and is regarded as one of the world’s leading multidisciplinary research universities. 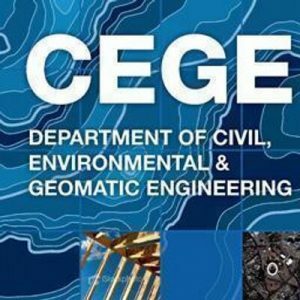 In 2007 the Department of Geomatic Engineering merges with the Department of Civil Engineering into the Department of Civil, Environmental and Geomatic Engineering.